I grew up in a church family, so you’d think that “church” would be an easy subject for me to tackle; however, this may be the most difficult project I’ve been assigned. The problem is that the concept of “church” means something different to me than it does to you than it does to anybody else. Your experiences, opinions, and religion (or lack thereof) make your relationship to “church” unique. It’s a deeply personal subject; so what then is our common ground? I would argue that there are at least two aspects of any church that we should be able to discuss without conflict. The first is history –records of dates and architecture and significance within a given time period; a rational person is not going to take offense to a factual account of the past. The second aspect of any church that we can discuss is its community outreach – how does the community benefit from the church? 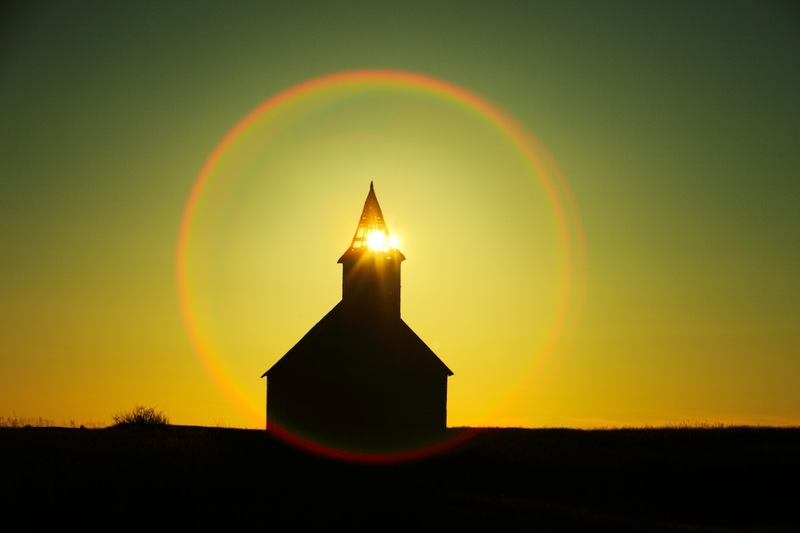 Throughout Montana churches have supported their communities in meaningful ways. Even if you have a harsh opinion of a church’s religious views, you’re not likely to have a problem with them feeding the poor or serving some other altruistic need. So this is how I plan to embrace such a broad and sensitive subject: I’ll explore church beyond religion. What were some of the first churches in our state? Why were they built and why have they endured? How have they molded Montana? This article won’t be completely void of religious rhetoric – how could it be given the subject? – but what it should do is allow us to examine with palpability the significance of Montana’s religious institutions. Montana, like America as a whole, began as a melting pot of cultures. The Enlarged Homestead Act of 1909 was particularly instrumental in enticing settlers, drawing in people of various ethnicities and backgrounds hoping to make a living on 320 acres per homestead. Railroad companies played a role as well; westward expansion was good for business. The Chicago, Milwaukee, & St. Paul Railroad encouraged settlement with pamphlets that praised the Treasure State’s fertile soil and delightful summers. As railroads expanded throughout Montana, town sites sprang up alongside them. One such town was Danvers, which was largely populated by Catholics of Austro-Hungarian descent. To serve the spiritual needs of the community, the Saint Wenceslaus parish was established in 1915 and in 1916 the Saint Wenceslaus Catholic Church was constructed. It was a simple but effective structure that served as the community center for both spiritual and social expression. Similar churches with steep gables dotted the countryside throughout Montana. Some congregations, however, served their communities without a church building at all. From its founding in 1916 to 1939, First Christian Church in Fort Benton operated without a complete church. The first services were held at the local courthouse and for over 20 years the congregation met in a basement. It was not an ideal location but it served the needs of the Christian community until a building could be completed, debt free, in 1939. As new communities emerged and grew, so did new churches. In 1886 First Presbyterian was the first church established in Great Falls, two years after the city’s foundation and three years before Montana was admitted into the Union. The church held its first services in a small school house until a church building could be completed in 1887. Later, First Presbyterian built a larger church in 1903, and later still, an even larger church was constructed in 1931 to meet the needs of the growing congregation. Great Falls’ Trinity Lutheran (Missouri Synod) underwent similar expansions. The church was established in 1892 with its first building erected in 1894 and a second, larger church constructed in 1930. By 1955, Trinity Lutheran had grown large enough to plant new congregations on the southeast and west sides of Great Falls. The groundbreaking of Eastside Trinity (later renamed Peace Lutheran) took place in 1957 and has since allowed the Lutheran Church to serve a larger area within the community. The expansion of Trinity Lutheran is particularly interesting considering its significance to Great Falls’ German population. From its foundation until World War I, Trinity Lutheran conducted its services in German. Similarly, Bethlehem Lutheran in Great Falls served the needs of the Swedish community. In 1905 the church’s first worship service was conducted entirely in Swedish at Grove Hall, a grocery store/community center. Bethlehem Lutheran secured a building in 1908 and worship continued to be led in Swedish until 1916. In response to changing cultural dynamics, the congregation voted to hold Swedish services in the morning and English services at night, but by 1922 the church was renamed “First English Lutheran” and everything was spoken in English – the prominent language in the area – to reach the community at large. One of the primary functions of a church is to form connections between attendees; however, once a congregation reaches a stable size, the focus tends to be shifted outward, which is why churches are generally upheld as pillars within their communities. Harvest Springs is one church that has been very innovative in its Great Falls community outreach. Throughout the year, the church offers numerous family-friendly events to the public, including a massive Halloween celebration called Kids Funtastic Fall Festival. This free carnival brings 4,000-5,000 people together each year to celebrate Halloween without blood and gore, which is particularly appreciated by families with young children. The church also hosts comedians, ventriloquists, and other performers (this year, including an African children’s choir), affording the public some cultural opportunities. One way that First English Lutheran manages and distributes resources is through Helping Hands Ministry, which supplies food and clothing to those who need them. As the program’s name indicates, the goal is to lend a helping hand (without undermining human pride and initiative). Helping Hands Ministry is one of many religious programs in Great Falls that provides food and clothing to the needy. With so many churches in Great Falls, each must discern how resources can best be used within the community. And to do that, many churches reach out to one another. The Downtown Samaritans are a group that meet to discuss the needs of Great Falls’ downtown community. They are comprised of religious leaders from First English Lutheran, First Presbyterian, Trinity Lutheran, Central Christian, First Baptist, First United Methodist, Set Free Ministries, Our Savior’s Lutheran, Episcopal Church of the Incarnation, Family Promise, and Saint Ann’s Cathedral and Soup Kitchen. The group meets once a month to discuss various outreach programs and ways that each church can best complement the others. “Our leaders meet to form a deeper network of services, with less duplication and more collaborative effort,” says Pastor Gwyn. One way the Downtown Samaritans have collaborated to better provide assistance to those in need is by developing a brochure detailing what each church offers and when. “We hope the flyer will decrease the frustration of trying to find meals, groceries, clothing, toiletries, and other resources,” says Pastor Gwyn. Church and charity have a strong association, but many of us don’t stop to consider the specifics of how churches are contributing to the community, not just with time and resources, but with physical, mental, and emotional support. This kind of support requires strong leadership, which is why Great Falls’ Central Assembly of God is working to produce leaders at a young age. Josh Jensen, the student ministries leader, says that one of the church’s goals is to help youth discover the joy of being a blessing to others. To make this goal a reality, Central Assembly has created a positive environment that forges meaningful connections between young people. As a result, service projects are not a burden but a fun and productive opportunity for the youth to come together and make a difference. “When people think of Central Assembly we want them to think of us as a group devoted to the community,” says Jensen. Meanwhile in Havre, Abundant Life Ministries has assembled their own astounding group of devoted community leaders. For a small church with an average attendance of 45 people, Abundant Life Ministries has a disproportionately high number of influential members, including a state senator, a state representative, a city judge, and the county superintendent of schools. In fact, Pastor Brian Barrows leads by example, serving on the Havre City Council. Anytime church leaders get involved in their community, there’s bound to be an impact. “Churches often contribute to communities in ways that aren’t easily measured,” says Pastor Ron Greene of Central Christian Church in Great Falls. While it is easy to quantify the amount of money that a congregation donates or the number of free meals a church serves, the impact of community support goes far beyond that. “Church leaders and members connect generations of people. Through their presence, they nurture influence for overall good within the community,” says Pastor Greene. By planting roots and sowing seeds within their communities, many of Montana’s churches have endured for over a century. Even in sparsely populated areas of the state, churches have survived by serving people’s needs spiritually and communally. Take the American Lutheran Church in Hogeland for example. Originally built in 1914 Silver Bow, the church withstood relocation to Hogeland in 1928, a population decline during the Great Depression, and the blow dealt in 1970 when Hogeland’s school closed. Despite so much adversity, American Lutheran remains. Today, the rural church is one of a few buildings left in Hogeland. There are roughly 50 members and attendance changes week to week, depending on the weather and commitments (such as school sports). Still, Pastor Ellen Ayres says that people make a real effort to come. “In this area church means a lot,” she says. Every Sunday, Pastor Ayres makes a 70-mile round trip to preach at the American Lutheran Churches in Hogeland, Turner, and Harlem along Blaine County’s “Big Flat.” For someone who was born within three miles of the Los Angeles International Airport, Pastor Ayres has adapted quite well to rural Montana. She is grateful for the opportunity to make a difference and enjoys seeing the communities come together for church service and in their service to others. Particularly in rural areas, towns cannot survive unless neighbors support one another. That is why American Lutheran is so important in a place like Hogeland. It’s a meeting place where members of the community can come together to seek blessing and discover ways to bless others. It is the heart of Hogeland. When American Lutheran had its centennial in 2014, nearly 300 people and eight clergy members attended the celebration. It was such a big event that most people couldn’t fit in the building; they had to gather around TVs that were live streaming the service in a tent outside. That’s how special this place is to people; more than 200 travelers came to a remote town in northern Montana to attend the anniversary of a church. That goes beyond religion. That kind of connection involves more than faith. American Lutheran and so many churches like it are creating lasting ties within their communities, bonds that will affect generations to come.